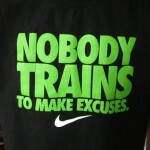 Tuesday Attitude: Train for the journey. Of course not. We train for a healthy body and functional fitness. And, sure, we train so we can participate in goofy Sunday Specials and Incentives. It’s time to put up…so Let’s…get…it…on! Check out the Sunday Special page for the Fall Contest (this event is a blend of a Sunday Special and CF Incentive). A weekend of evening WODs…Oct. 7, 8, 9…kind of CrossFit Games style. The WOD will be released only the night before. Be prepared for anything. Sign up on the whiteboard (1 slot each night). Each night there are 4 time heats. Each heat is 30 minutes long and can accomodate 8 people (based on equipment). Anyone can sign up, however, you should have a working knowledge and familiarity with ANY and ALL of the following (but not limted to): a) the 9 foundational crossfit movements, b) hybrid moves like burpee and thruster, c) specialty moves like a KB swing and Double Under, d) bodyweight exercises like a pullup and dip. And, you ought to have that mad-dog, challenge-seeker, competitive mentality. In line with the core of CrossFit programming, this will be a contest, a competition…HOWEVER, so that anyone across abilities is lured to participate, you can join either the Competition group or sign-up as Open/Fun. If you’ve been participating in the M & W CrossFit classes, then this is a great chance to challenge your skills and athleticism. Be sure to consider participating. Remember the last Sign-Up Incentive (Survive the Scorcher)? 26 folks took that on. Get your name on the list early so you can get in the heat you want. This fall incentive is right up my alley! May have to come home to compete with the Corps Fitness Phools. Nice! I’ll put you down for the 1st heat each night…phools can watch and learn! Seriously!!! You guys are purposely scheduling these things when I am not in town. Damn it! Well I should be back Sunday, I’ll at least do one.